The Integrating Agriculture in National Adaptation Plans webinar on Ecosystem-based Adaptation (EbA) and National Adaptation Planning: Opportunities for the Agricultural Sectors provides an overview of how EbA can be effectively integrated into agriculture sectors’ adaptation strategies and broader national adaptation planning processes. The webinar focuses on mainstreaming EbA in the formulation and implementation of National Adaptation Plans (NAPs). Global presentations and a presentation from Thailand (a partner country in the NAP-Ag programme) outline opportunities, experiences and approaches in mainstreaming EbA into adaptation policy planning processes and strategies at different scales. 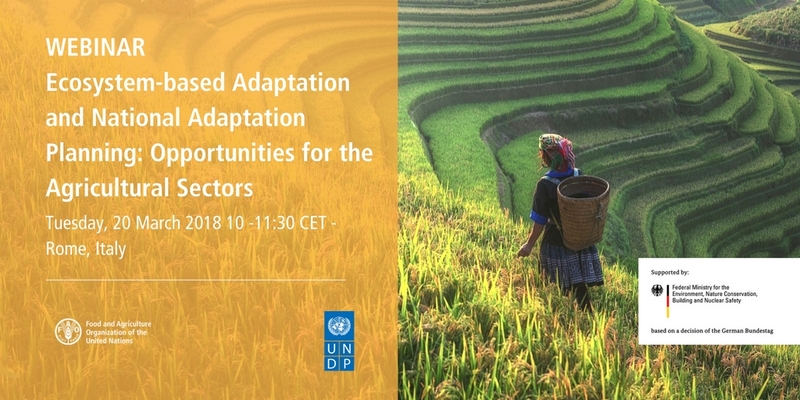 This webinar complements the webinar series on Scaling up of Adaptation in the Agricultural Sectors (SAAS), which aims to highlight methods and tools to support the implementation of ecosystem-based adaptation in the agriculture sectors. There are several areas of coherence between an ecosystem-based adaptation (EbA) approach and NAP processes. EbA could become part of a policy or planning objective and a means for implementing adaptation; EbA also aims at the reduction of vulnerability and enhancing the adaptive capacity and resilience of ecosystems and communities that depend on them. EbA practices can be integrated into different planning processes and systems, across sectors and scales. As NAPs vary from country to country, the integration of EbA into a country’s NAP will also vary. The presentation suggests some ways in which EbA can be mainstreamed throughout the NAP formulation and implementation process as provided in the UNFCCC Least Developed Country Group NAP Guidelines. In Nepal, IWMI is implementing a national EbA programme to build climate resilience in the watersheds in mountain eco-regions. The programme aims to mainstream climate risk management through the building of climate-resilient communities with the aid of private sector participation. Its primary activity is to formulate a new landscape-based approach, focusing on integrating natural resources to manage both surface and groundwater needs. Proper institutional coordination is key to the implementation of EbA strategies. For example, a project steering committee improves inter-agency synergies at all levels. A monitoring system to collect and evaluate hydro-climate data is also essential for establishing a knowledge base and measuring results. Test sites provide opportunities to evaluate the impacts of landscape-based interventions and provide case studies for knowledge-sharing. In the case of Thailand, the formulation of the country’s NAP has seen EbA practices mainstreamed in adaptation plans in the agriculture sectors, primarily though the management of fluvial systems. By building resilience to extreme weather events that have caused flooding and drought, Thailand has implemented EbA practices through its NAP formulation and implementation actions. EbA and co-benefits from increased biodiversity are leveraged to implement low-cost, viable and sustainable agricultural adaptation options to build resilience. The presentation outlined the value of vulnerability assessments, economic assessment tools and stakeholder participation in the formulation of an adaptation roadmap. It also shared lessons learnt on integrating and implementing EbA practices as part of Thailand’s NAP process.